Close your eyes. Envision yourself in Dar es Salaam seated on a restaurant terrace at the edge of a cliff. Far below, for as far as you can see, is water—the Indian Ocean—with a couple of ships sailing in the distance. A refreshing breeze blows gently around you. The day is warm and sunny. Have any idea where you might be? If I did a good job describing what I had in mind, then you’d correctly guess that you were at Karambezi Cafe at the SeaCliff Hotel in Masaki. If there’s one place I have visited more than any other since I came to Dar es Salaam, it’s SeaCliff Hotel’s Karambezi Cafe. Why? Because Karambezi Cafe is my household’s favorite place to enjoy the last of the weekend. 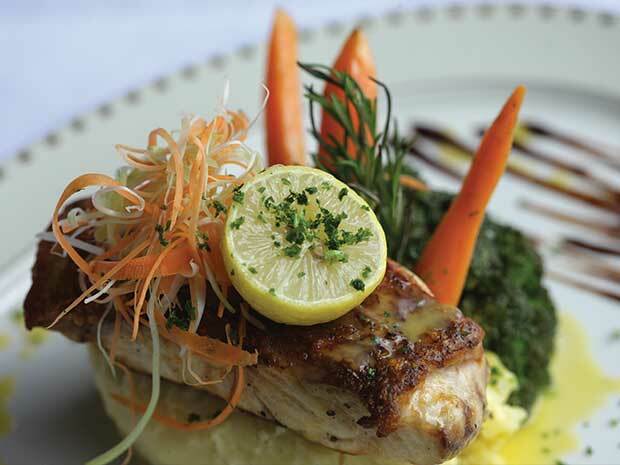 For us, Sunday evening is not quite Sunday evening without heading out to SeaCliff Hotel for dinner or drinks. Today, I’d like to tell you a little bit about what you, too, have to gain by visiting Karambezi Cafe. 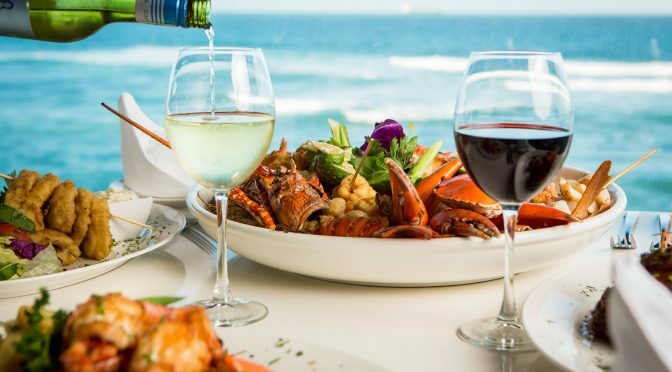 First and foremost, Karambezi Cafe is not actually a cafe (though it has a cafe section) but rather an upscale bar and restaurant located at the equally upscale SeaCliff Hotel. What I find most spectacular about Karambezi Cafe is its location and environment. Located at the edge of a coral cliff overlooking the Indian Ocean—hence the name SeaCliff Hotel—Karambezi Cafe is one of the best places to experience Dar es Salaam’s proximity to the Indian Ocean. Because it’s located far above sea level, sitting at Karambezi Cafe permits you to see further out into the ocean than usual while eliminating unpleasant unkempt shores that are so typical elsewhere in Dar es Salaam. 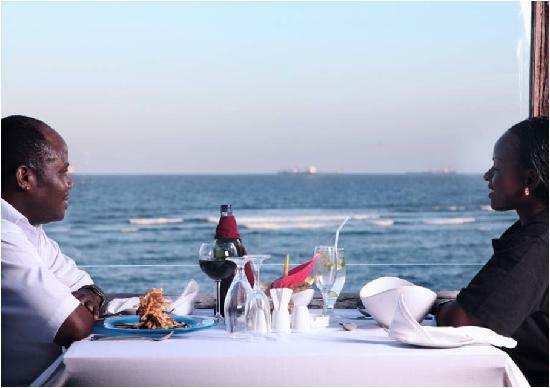 This gorgeous view of the ocean is enhanced by a wonderful sea breeze which is never too strong nor too light (the restaurant terrace is separated from the sea by a protective glass pane), and depending on how much sun and wind you enjoy, Karambezi Café offers both covered and uncovered sections to suit your preference. 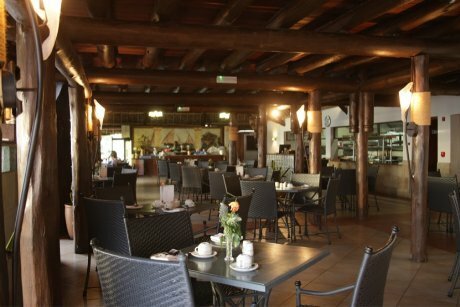 As a restaurant, Karambezi Cafe offers an extensive range of options, many of which are very good if not a bit overpriced. Personally, I love the Smoked Salmon or Local Smoked Sailfish (Tsh 13,700) which is not only delicious but also well presented, as is all the food at Karambezi Cafe. I also often order the Chicken Tikka with Spring Onions & Feta Pizza (Tsh 13,200), which although not an Italian wood fire style pizza is pretty good in its own right. I wish I could make the blanket statement that the food at Karambezi Cafe is good all round, but from my experience, the truth is that this is one of those places where you need to know how to pick and choose from the menu. For instance, I find that fish and seafood is generally very good at Karambezi Cafe but after ordering steak there one day, that’s not something I am keen to repeat. Click here to see Karambezi Cafe’s full menu. Have I ever mentioned that I’m very adventurous when it comes to drinks? Well even if I haven’t, I’m sure you can tell from all the different kinds of beverage posts I have on this blog (like this one on wine, this one on gin, this one on rum, and this one on Konyagi and Uganda Waragi). That’s something else that I enjoy at Karambezi Cafe: its very well-stocked bar (though the tots they serve are smaller than those served at many other places in town). When I am not in the mood for an alcoholic beverage, Karambezi Cafe also serves hot drinks (such as cappuccino, hot chocolate, and tea) as well as great fresh fruit juices (their watermelon juice is delicious!). I’ve been told they serve mean cocktails too, but that’s something I’ve never tried personally. So, with good food, your choice of drinks, and a great environment, what more could you possibly ask for from one establishment? Why, entertainment of course! Here too, Karambezi Cafe aims to please. On Saturday and Sunday evenings, Karambezi Cafe hosts a live band. If Karambezi Cafe is already a great place to be on any odd day, imagine how much better it becomes with strains of live music that are neither too loud to hamper conversation nor too soft to fade away too far into the background. I highly recommend visiting this establishment on such an evening, especially if you manage to catch the last of the day’s sun after the band has already started playing! There you have it. If you happen to be in Dar es Salaam and are looking for a cool breezy place to enjoy the best that the Indian Ocean has to offer, then I suggest you pay Karambezi Cafe at the SeaCliff Hotel a visit. If you’ve already been, I’d love to hear what you have to say. Please let me know by leaving a comment below. I’ve never been to Dar but this place sounds amazing.. Many of us in Dar go to this place so often that we take it for granted but really, it is amazing! When you finally fika East Africa, as I see you are going to do soon from reading your blog, schedule a visit to Dar es Salaam. When you do, don’t forget to visit Karambezi! You took me to the place. I remember being close by when this was being proof read by your household 🙂 good times !!!! lovely place,been there twice and going back again early January.The food was excellent and friendly staff to compliment the atmosphere,”the live band” wooow….that was something else.We had a great evening. Welcome to ChickAboutTown. Thanks for your comment. May you have as good a time at Karambezi in early January as you did in the past!